Frank gives Ness some insight into Giant Step and sends him on his way. Luckily for Ness, major physical changes to main characters for the sake of comedy return to normal once the joke is done! After the Orange Kid fiasco, Ness finds a reliable friend in the Apple Kid. Also, he gets a very retro phone. On his way into Peaceful Rest Valley, Ness encounters a very dangerous foe. Perhaps that Hippie was onto something afterall. A most disturbing musical begins! Set to the vocal version of Flying Man, this trippy experience shows the dangers of mushrooms. Remember, kids, do drugs and freakish musicals will assault you. With the song coming to an end, Ness manages to snap out of his funk. Unfortunately for him, he missed out on the chance to make an easy $50. Without the Pencil Eraser, Ness finds himself trapped. Unfortunately for him, game mechanics prevent him from going forward. 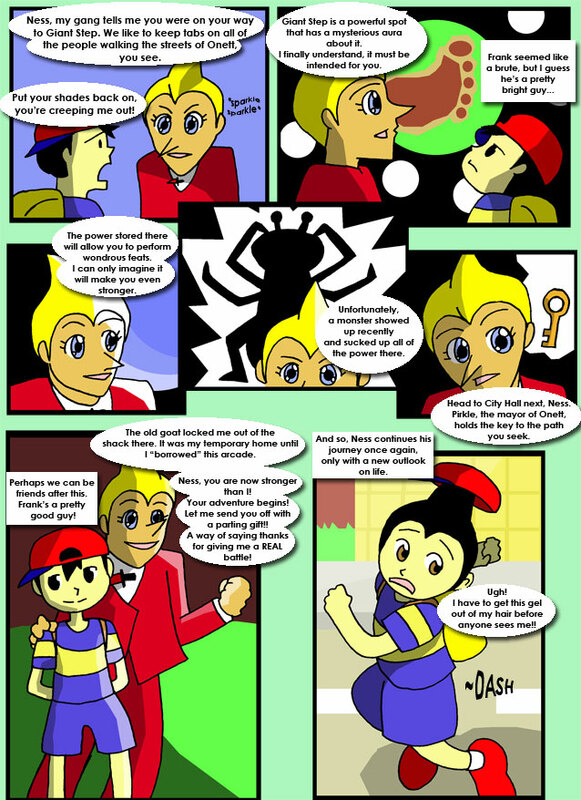 Poor Ness...if only he knew this was a comic based on a game. FANART >:. ...> Happy Anniversary, Mother 3!